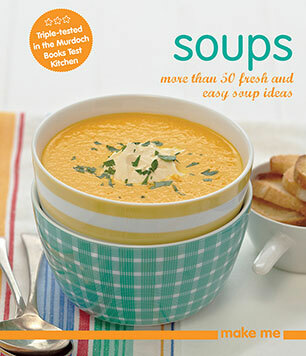 A brand new collection of easy-to-make, flavoursome soups from the Murdoch Books Test Kitchen. Appealing in both summer and winter, these soup recipes are versatile enough to act as appetizers or entrees. Chapters dedicated to healthy, quick, and traditional soups will cater to the health conscious, time poor, and flavor seeking. Recipes include Pumpkin Soup with Harissa; Easy Bouillabaisse; Greek-Style Lamb Meatball Soup; Goulash with Herb Dumplings; Mexican Cream of Corn Soup; Crab Bisque; and Cold Avocado Soup with Lime-Pickled Onions. A basics section full of accompaniments will also help dress up basic soups with spice and seed sprinkles and croutons or make meals fun with grilled cheese. Includes dual measures.